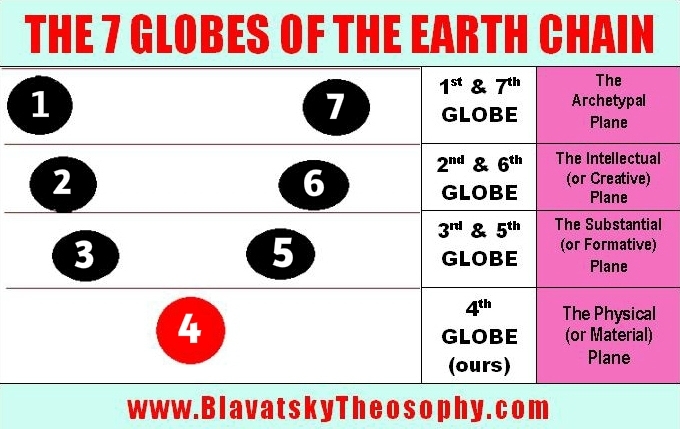 Our planet Earth is part of a chain of seven globes, referred to as the “Earth Chain.” This planet we are on thus has six companion globes which are not seen by us, due to the fact that they are on three different planes to ours. The plane that our globe is on and the three higher planes on which the six other globes are situated are together called the “Four Lower Planes of Cosmic Consciousness.” The Cosmos in its totality consists of Seven Planes, these four lower and also three higher…a lower quaternary and a higher triad, just as with the Seven Principles of the human constitution, where there are four lower and mortal Principles and an immortal trinity of higher spiritual Principles. In this diagram we see the correspondences between the seven globes of our chain and the four lower planes of cosmic consciousness. This teaching and knowledge about the chains, globes, etc. is considered extremely important and useful by the Masters of the Trans-Himalayan Brotherhood and was taught carefully and precisely by the Master K.H., the Master M., and H.P. Blavatsky during the early days of the Theosophical Movement. Up until then it had been an entirely secret esoteric teaching, reserved solely for chelas (accepted disciples) and initiates and had never before been given out to the world. After Madame Blavatsky’s death, however, some leaders of the Adyar Theosophical Society such as C.W. Leadbeater and Annie Besant (but not those of the other Theosophical Societies and branches of the Movement which had broken away from the Adyar Society in order to stay true to the original and genuine teachings of HPB and the Masters) began to teach and popularise A.P. Sinnett’s earlier mistaken notion that the 3rd Globe of our planetary chain is the planet Mars and that the 5th Globe is the planet Mercury. This illogical teaching – which has caused much confusion and misunderstanding and which is in direct contradiction to the teachings of the Masters themselves and “The Secret Doctrine” – is of course astronomically and astrologically ludicrous. Also, if those two planets were part of our planetary chain then we would not be able to SEE them or know anything about them, as the 3rd and 5th globes of the chain belong to the Substantial-Formative Plane, a plane entirely above the perceptions of the Physical Plane. But we do see Mars and Mercury and know about them and thus the planet Mars and planet Mercury must undeniably be globes on the physical plane and thus they must each belong to a separate planetary chain of their own. A planetary chain can only ever have one physical material globe in it, just as the septenary human being only has one physical body. The law of analogy and correspondence runs like a beautiful thread throughout all genuine esoteric teaching but is glaringly absent or distorted in the cheap imitations. All the mention of chains, globes, rounds, and root races in Theosophical teaching can understandably seem quite confusing and difficult to understand. Yet the Masters behind the Theosophical Movement considered it important that we do clearly and accurately understand it because not only does it reveal the actual nature, origin, and future of our planet but it also provides important symbolical keys for unlocking greater mysteries through this law of analogy and correspondence. * Our Earth evolution consists of numerous successive Chains, each of which is comprised of 7 Globes as shown in the diagram. * The chain which is in evolution now (and which we call the “Earth Chain”) had chains preceding it and which have already run their course, completed their evolution, and ceased to be. The future Chains have not yet come into existence but they will do so in the future, successively, as each chain is the product of its predecessor. * The former Chain is known as the “Lunar Chain” or “Moon Chain” because the dead planet called the Moon, which is the satellite of our current Earth, was the 4th Globe of that prior Chain. In other words, the sphere which is now our Moon was at one time the former living “Planet Earth,” on which we ourselves were evolving in much lower kingdoms of nature. This was of course untold billions of years ago and is virtually incomprehensible to us. * The evolutionary Life Wave passes through each of the chains 7 times and these are referred to as the 7 Rounds. Each Round sees humanity reaching a significantly higher level of evolution, both inward and outward, but the inward being the most important. A Round begins on the 1st Globe of a chain and causes that globe to become active and alive. Seven major epochs of civilisation occur during each of these periods and in Theosophy these are called the 7 Root Races, since each of them sees a new major “race” or “type” of humanity coming to the forefront and predominating. * Once the 7 Root Races have run their destined course of evolution, the Round of the Life Wave passes on to the 2nd Globe and so on, all the way up to and including the 7th Globe, with 7 Root Races arising each time. When the evolutionary Life Wave leaves one of the globes of the chain and passes into the next globe, the globe it has left enters a period of inactivity with only a bare minimum of life (non-human) left on it…until the Life Wave eventually reaches that particular globe again, which will be the next Round. * We are currently on the 4th Globe of our Chain and this Chain is in its 4th Round. This current period of our Earth civilisation is its fifth successive major epoch, termed the 5th Root Race. 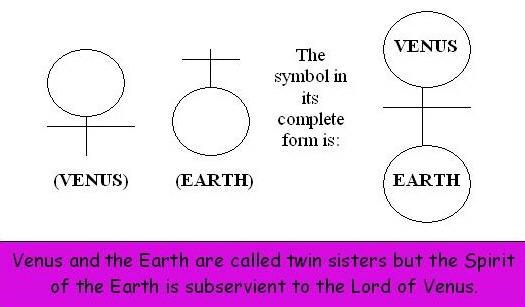 The 1st Root Race on our globe during this 4th Round is referred to in the Teaching as the Polarian Root Race. The 2nd Root Race was the Hyperborean Root Race. The 3rd Root Race was the Lemurian Root Race, the 4th Root Race was the Atlantean Root Race, and this 5th Root Race is referred to as the Aryan or Indo-Caucasian Root Race. * Each Root Race consists of 7 sub-races. The 6th sub-race of the 5th Root Race may very gradually begin to come about over the next few hundred years but the 6th Root Race is a very long way off indeed. * Most of us who are humans today were animals on the Moon Chain and those who are currently animals today will be humans on the next chain, as every Monad (every “Divine Spark” which has been sent forth from the Absolute) evolves progressively and gradually through the mineral kingdom, vegetable kingdom, animal kingdom, into the human kingdom and beyond. LIFE can never be static but is always developing, advancing, and evolving, ever onward, ever upward, ever Godward. By the time of the subsequent Chain, we who are humans today will have entered into a far higher and more spiritual state of existence. * In the great evolutionary scheme, each Round of the Life Wave through our Earth Chain – and to a lesser extent, each Root Race during each Round – is intended to develop one of the 7 Principles in the human constitution to perfection. But if we don’t know or understand what the 7 Principles are…if we abandon and reject this teaching of the Masters about the 7 Principles (which they consider to be vitally important and essential and which is more or less the foundation of their Esoteric Doctrine) in favour of the pseudo-Theosophical teaching about the constitution of man as presented by such people as C.W. Leadbeater, Alice Bailey, Annie Besant, etc…we won’t be able to understand or realise the true nature of the way in which things proceed. * At the exact middle point of the 5th Round of this Chain will come the “moment of choice,” the “Day of Judgment” so to speak, of those who are prepared to keep moving ever onward and upward in their inner evolution and those who aren’t. Those who aren’t will not “make the grade” and they will be taken out of incarnation until the next Chain, their spiritual development and advancement being delayed and postponed for an incredible amount of time, all as a result of their own spiritual and mental laziness and refusal to make any effort. The reason this will happen is in order that human evolution can continue to move forward as it should, rather than being held back by those souls who refuse to evolve. * Every planetary evolution in the solar system is confined in its manifestation to these “Four Lower Planes of Cosmic Consciousness.” The law of cyclic evolution – involving chains, globes, rounds, root races etc. – applies to all the planets of our solar system, as HPB and the Masters teach that almost all the planets in our solar system, as well as those beyond it, are inhabited. It’s also taught that Venus is “the Guardian Spirit of the Earth and Men” and that “according to the Occult Doctrine, this planet [Venus] is our Earth’s primary, and its spiritual prototype.” We are told that every change that takes place on Venus “is felt on, and reflected by, the Earth.” The planet Venus, adds HPB, “is the LIGHT-BEARER of our Earth, in both its physical and mystic sense.” Venus is “the bright and morning star,” which is an appellation applied to both Lucifer and Christ in the Bible. For one thing, study of spiritual, metaphysical, and philosophical teachings is in itself a valuable spiritual exercise. It helps to elevate our mind and consciousness out of, and above, the ordinary everyday things of matter and the senses and allows us an inspirational and intuitional glimpse of a higher and greater reality than we would otherwise perceive. That alone is surely enough reason to condone and encourage the effort to study and gain deep understanding of the more complex aspects of Theosophy. SOME RELATED ARTICLES: The Men from Other Planets, Mars, Mercury, Venus, Human Evolution in The Secret Doctrine, The Planetary Spirit of the Earth, Lucifer the Lightbringer, The Sevenfold Nature of Man, 12 Things Theosophy Teaches, The Closing of the Door into the Human Kingdom, Responding to Lies about H.P. Blavatsky, Who was William Quan Judge? and The Seven Planes. How many years approximately is a round? Could his explain why we can’t explain advanced civilizations vanishing with no trace like Easter Island and Pre Columbian civilization like in Machu Pichu? How does this explain why really ancient civilization was more advanced than us when it comes to feats of engineering with stone? Which civilization started the 4th round? The various Rounds are not all of the same duration and it’s stated that their real lengths and figures are not permitted to be given in print, so this is a question that we cannot answer with any definiteness, due to lack of knowledge on the matter. Easter Island is also referred to in the information in this article. Hello. If you dont mind, i have two questions that need answering. First, is this teaching, that that we are constantly evolving through a stupendous amount of time and in an ever increasing state of consciousness, incompatible with the possibility of one attaining final liberation (nirvana) here on earth in our mortal bodies? Are the many stories in the world’s literature of people attaining liberation just fictional? From my perspective, this article makes union with Brahman seem like an unreachable feat. As for my other question, it is said that on the archetypal, intellectual and substancial planes there are two globes and yet they are in coadunition with earth? Let’s assume i start functioning on the substantial (astral?) plane. Would i see two different planets or i would see one where the earth was in the lower astral realms and another on the same place in the higher astral realms? To attempt to answer the first one: No, it is not incompatible, nor does it mean or imply that union with Brahman is an unreachable feat. To clarify, the teaching is that anyone can attain Nirvana at any time during this vast evolutionary cycle, if they make the necessary progress within themselves. This is entirely up to the individual. If you or I were to reach the required conditions, we could potentially enter into Nirvana today. We would then be reabsorbed into the Absolute and yet the evolutionary cycle on Earth and in the solar system and beyond would still be continuing for everyone and everything else. In Theosophy, however, the motive for attaining enlightenment is not in order to literally enter Nirvana and leave the world behind, but rather to renounce the bliss of Nirvana in order to follow the Bodhisattva Path, the way of the Buddhas of Compassion, who vow to remain with suffering humanity, in order to help, guide, instruct, and lead them on, to higher things. There is a grand, majestic, yet mysterious (to us, at least, at this present time) purpose and aim to Cosmic Evolution and we are not playing our proper part in it if we seek to escape from it. There are two Paths spoken of; the Path of Liberation and the Path of Renunciation. The Path of Renunciation is that which is upheld and recommended in Theosophy. You can read more about this at https://blavatskytheosophy.com/the-two-paths/. Those great Teachers who Theosophists speak of as “The Masters” are such Bodhisattvas. If They wanted to, They could enter Nirvana, as They have reached that point, but They decline to enter in, and They say that Buddha also declined to enter in, despite what the orthodox Theravada Buddhists say. So “distance” is not a factor in this. But yes, as far as we understand it, the Theosophical teachings are saying that one who functions or perceives in the right and corresponding “frequency” in the astral plane will be able to see or have some knowledge of the third and fifth globes of our Earth Chain, whereas the fourth (that globe on which we presently live) is situated on the dense material physical plane. However, it may be remembered that evolution proceeds on only one of the seven globes of a planetary chain at any given time and thus the third, fifth, and all the others of our chain apart from the fourth, are said to be currently in a state of minor Pralaya – i.e. inactivity, dormancy, latency, periodical rest – until the evolutionary life wave reaches them in turn again. Perhaps think over what has been said and read more about these subjects, such as in “The Ocean of Theosophy,” “The Secret Doctrine,” and William Judge’s three articles on “The Earth Chain of Globes” and you will probably start to gain clarification. If you don’t mind, i have few questions. First of all you have said, we in the 4th round and middle of the 5th branch race of the 5th root race. Everywhere 7 is number, 7 rounds,7 root races. From puranas, we know currently it is vivatsvata manu’s reign. However, it does not seem to be so from the article above. Other than that, are those 7earths 7 dvipas that we have read about in puran? The previous moon chain you mentioned, when we came from there didn’t our livewave started from globe A, in that case are still life in there? Are there life in any of those 7 moons? The article does not contradict this idea and nor does Theosophy in general, since the Theosophical teaching is that this 4th Round is “the Vaivasvata Manvantara or “Round”” (H.P. Blavatsky, “The Secret Doctrine” Introductory, p. xliii) and Vaivasvata Manu is described as the “Root Manu” for this entire 4th Round as well as the Manu of the 5th Root Race. This is something which is referred to numerous times and in quite some depth in “The Secret Doctrine” and other sources such as “Transactions of the Blavatsky Lodge” and “The Secret Doctrine Dialogues.” It is not possible for us to go into it in great depth in a website comment. However, it ought to be borne in mind that when HPB refers to Vaivasvata or any other Manu, she is not speaking of an anthropomorphic being or individual entity but usually of an impersonal Energy or even Hierarchy of beings and forces. In other words, the statements of the Puranas are not taken literally or in their “dead letter” sense. Yes they are and you will probably find it interesting to read about this in “The Secret Doctrine” Vol. 2, p. 320. Our own planet – the 4th Globe of this Chain – is Jambu-Dvipa. But the Dvipas also represent and symbolise other things besides the seven globes of the Earth Chain. I hope this helps in some way. Please feel free to ask further questions.